Did you have a dream about someone you know? You very likely have seen friends, family members, neighbors, co-workers and other people appear in your dreams. Maybe you have even had a dream about a mysterious person who you have never met! People in our dreams are very common. When you consider that most of us talk to other humans every day of our lives, it's not surprising that people would make an appearance in our dreams! When we understand what these dreams mean, we can use this insight to help us with our own personal development, our careers, our relationships with others and more! What Does it Mean to Have Dreams About Someone? The best way to understand the people in our dreams is to imagine them as characters in a story. We've already talked about dreams as stories on our site, and so if you think of your dream as having a setting and a plot, of course it will have characters! Our family, friends, and even complete strangers may appear in a dream as characters in a dream. They often appear as actors and actresses playing a specific role. These people in our dreams as actors and actresses can play various roles and represent many different things in dreams. Sometimes they symbolize a particular character archetype - other times they are in a starring role as your own self! Being able to see this person as simply a player on the screen makes it a lot easier to understand what they might symbolize in the dream, or if the dream could be about something important for us to know. The people in our dreams typically fall into one of three primary roles. ￼Here are some common ways characters present themselves in various roles in dreams. This is most common when you have recent experiences involving the person. This person is "fresh in your mind" still, so it is not uncommon that you might have stirred up some thoughts and feelings associated with the person. You dream of your significant other after experiencing an argument. Occasionally, you may also have a precognitive dream about a person. Before you panic, most dreams are not literal in nature. If you dream of someone dying for example, this is more likely a symbol of a person changing than actual death. It is also completely possible to have dreams of a person that communicate a specific message. For example, one time I dreamed of a friend having the baby she was expecting - sure enough I woke up to find out around the time I had this dream she had texted me to let me know! We can also have dreams about people who are passed on. I have had many dreams about people who have died, and in many of these they are what I call Visitation Dreams. These dreams have some very clear characteristics that make it easy to recognize when you are truly communicating with someone who is passed on compared to a simple release dream that is expressing thoughts and emotions. If the person is currently alive in real life, it's also completely possible that you and another person are sharing a dream experience. In those cases, you might talk to a friend and find out you both had the exact same dream with each other. This is most likely if you are both very vivid dreamers and at least one of you has the ability to lucid dream. While all of these dream scenarios are totally possible, they are not very common for most people. I have only had a few instances of shared dreams with others, but I've probably had thousands of dreams about people. Make sense? Good! Let's move onto understanding people in our dreams as symbols. Most of the time, the people in our dreams are actually symbols. They can be symbols for a specific thing or even our own emotions. Dreaming of a distant cousin may symbolize feeling distant in situations in life. When you dream of a person and you are pretty sure they are there as a symbol, it can be helpful to think of your own personal associations with the person or try to identify them as one of the 12 character archetypes. This can help give you some insight on what the dream means. Characters featured in your dreams many times may even star as YOU. This may be very surprising for people, but someone has to play a part for you in a dream! This is where people step in to play as actors and actresses. Someone in a dream playing a role as you is especially true if it is someone from the past or someone you do not recognize. You dream of a former co-worker, representing the career/professional aspect of yourself. You dream of a stranger as a cashier while shopping in a dream - the stranger represents you looking at your current choices to make a decision. In most dreams, these characters either symbol an external force or very likely some aspect of yourself or your own life. ￼To better understand the characters and people in your dreams, it helps you answer some questions about them. This will help you to identify what type of dream character they represent, as well as help you better relate the meaning of the dream into waking life. Name – Does their name have any special meaning or significance? Age – How old are they in the dream? Relationship to You – How do you know this person? Physical Characteristics – What do you notice about the person’s appearance? Personality Traits – What is their personality like? Choose 3 Words to describe to the character in the dream. What profession or role in life does this person have? What mood or emotions did the person make you feel? 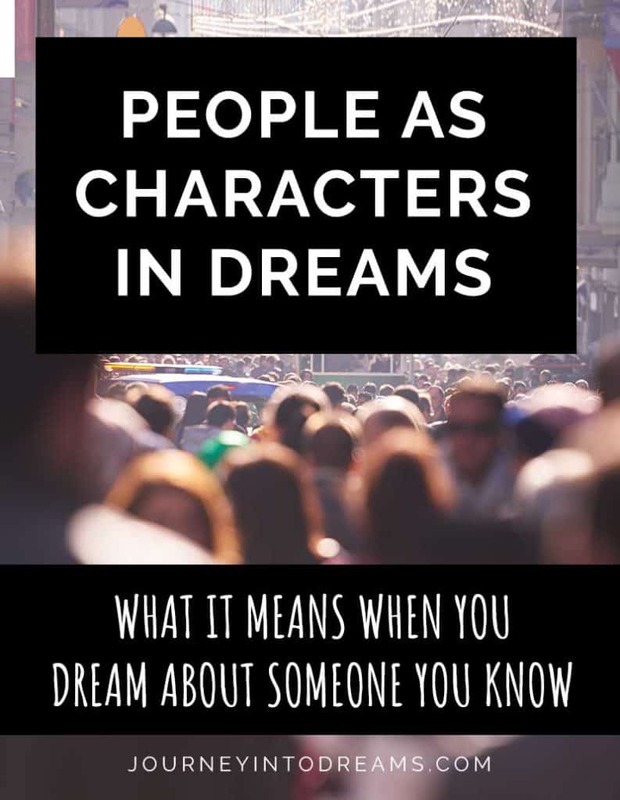 Answering these questions about characters will help you make associations and identify whether the person is a symbol, a representation of a part of yourself, or if the character is playing the role of themselves in the dream. If you are wondering what it means to dream of someone, learning about how people present themselves in dreams can be very helpful. Often times when you ask the questions we listed above it and think about current events in our lives, it becomes very clear on why this person might be appearing in our dreams! Want to Learn More About Understanding the Meaning of Your Dreams? Do you have any dreams of people you would like to know more about? Share your thoughts and dream experiences in the comments section below!